Orbit Downloader is a great speed, super light,easy-to-use free download manager. It is based on p2p and multi-source downloading technology and supports HTTP, HTTPS, FTP, MMS and RTSP protocols. Using Orbit Downloader, you can almost download everything online with 500% faster speed, like youtube video, Rapidshare files, flash and streaming media etc. Anyway, Orbit Downloader is an indispendsable tool for download acceleration and management. Orbit Downloader supports Rapidshare & most of the file-sharing service websites, including megaupload, badongo, sendspace, sexuploader, yourfilehost, uploading, filefront, 4shared, turboupload, depositfiles, filefactory, and more. - Great Speed. Orbit Downloader is based on p2p and multi-source downloading technology, which make you download files up to 500% faster than before. - Super Light: micro-sized and resource-friendly. Orbit Downloader is written with efficiency in mind, it typically uses less than 3MB of memory and 3% of cpu when downloading. Additionally, the installation package is less than 1.6MB. - Easy to Use. Orbit Downloader has a simple and clear user interface. It is easy to use and config for both newbies and professions. - The Most Comprehensive Download Tools. Internet Downloader all in one: Orbit Downloader supports most protocols and have a function of “Flash and Streaming Media Capturer”, so you can download videos from youtube metacafe, files from rapidshare, metalink files, flash and streaming media online more simple and easy. - Free and Safe. 100% free and no registration allowed. No adware!!! No spyware!!! In general, Orbit Downloader is based on P2P techonology. It has a smart download logic accelerator that features intelligent dynamic file segmentation. And it has advanced robust multithread download algorithm implemented with high quality. 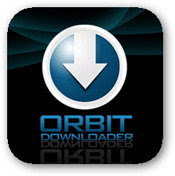 Orbit Downloader can download up to 500% faster with great acceleration. 2. Support Youtube video, Rapidshare files download. 3. Catch Flash and Streaming media online. When you hover your mouse on the flash or streaming media file in the webpage, Orbit Downloader can recognize the flash or streaming media automatically and display a small button on it. You can easily download the flash or streaming media file with one clicking on the small button. 4. Support IE, Firefox, Maxthon, Opera. Orbit Downloader supports IE, FireFox, Maxthon and Opera. Orbit Downloader supports Metalink download and gives you extremely fast download speeds. 6. Support HTTP, HTTPS, FTP, MMS and RTSP protocols. You can easily download files with a browser click from any remote server via HTTP/ HTTPS/ FTP/ RTSP/ MMS. 7. Support Proxy server configuration. You can set Orbit Downloader to use a proxy server. Orbit Downloader can work well with HTTP,HTTP and SOCKS5 protocols. 8. Support download pasue and resume. Orbit Downloader can resume broken downloads. So you needn't start the downloading process from the very beginning after casual interruption. You can resume unfinished download from the moment when it was interrupted. Orbit Downloader's easy-to-use management features and simple-yet-powerful configuration options can make both your downloading process and downloaded files management as easy as never before.